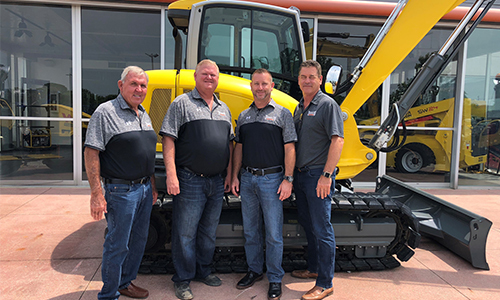 Franklin Equipment was founded in early 2008 by four partners—Gary Gabriel, Troy Gabriel, Tom Richardson, and Tony Repeta. Together, they have over 150 years of experience in the equipment and rental industry. The Gabriel Family has been in the equipment industry since 1952 when Gary’s father, Sam, opened Sam’s Equipment Rental. The company expanded to five locations and became the dominant rental company in Central Ohio. Sam’s was sold to NationsRent in 1997. On April 20, 2008, Franklin Equipment purchased the assets of Franklin Tractor and began the process of revamping the dealership’s operations. Since then we’ve invested heavily in facility upgrades and improvements. We then opened satellite branches in Dublin and Newcomerstown, and installed new information systems. In 2014, we moved our Columbus branch into our new 65,000 ft2 superstore. Since 2015, we have added 12 new store locations – Westerville, OH, Indianapolis, IN, Milwaukee, WI, Dayton, OH, Cincinnati, OH, Nashville, TN, Louisville, KY, Racine, WI, Lexington, KY, Oshkosh, WI, Knoxville, TN, Carmel, IN, Chattanooga, TN & Decatur, AL. We also assembled the best team of experienced rental and equipment personnel in the industry. On average, our team members have over 20 years of experience in the equipment business, and many worked with us at Sam’s Equipment Rental. They know what it takes to provide the kind of service you demand, and they do it every day. Whatever equipment problem or need you have, we’ve seen it before, and we know how to help. Today, Franklin Equipment serves thousands of customers in the Midwest and beyond. Our customers are demanding and exacting; they know their equipment, and they trust it with nobody but the best. We value all of our customers, and we treat each of them with the courtesy and respect they deserve. We appreciate your business, and we look forward to serving you soon. The Gabriel family has a great story of their love for the rental industry and how the Franklin teams focus daily on “Saying YES and making it easy to do business with Franklin!” Franklin Equipment is becoming a strong regional company in the Midwest!